I’ve heard that foundation is best applied with fingers. The problem with that is that your fingers get all messy and every item of makeup you touch gets dirty, until you wash the foundation off. That takes time that no-one has to spare when getting ready. The Shiseido Perfect Foundation Brush is the next best thing. 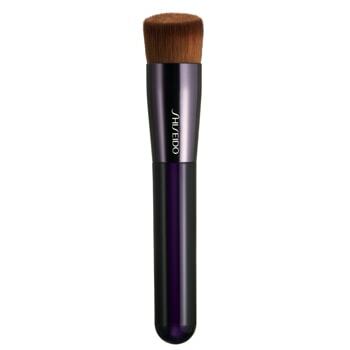 Here’s a brush that you can use with any type of foundation. The Shiseido Perfect Foundation Brush is great for liquid, cream and powder foundation. Shiseido Perfect Foundation Brush helps the foundation adhere to your skin, seamlessly. The tapered bristles allow for easy application and the short handle is great for maneuvering around the corners of your face. Another great thing about this brush is that it’s small enough to not take up too much precious bathroom space. You can find the Shiseido Perfect Foundation Brush at your leading makeup stores or by clicking here.